Philadelphia’s coolest place to “chill” out. Are you ready to toss away your ice pack, and get into a cryosauna? This cooling treatment is performed in a walk-in chamber which uses hyper cold temperatures as low as -240 Fahrenheit. Orange Cryo Wellness is the first Philadelphia Business to offer both whole body cryotherapy, and cryofacials, in one location! Owner Robin Gupta states, “I wanted to bring to Philadelphia what the stars and elite athletes have had access to for maintaining their youthfulness, treating injuries, and fighting inflammation”. The exposure to the extreme temperatures triggers the release of anti-inflammatory molecules and endorphins. To prep for treatment you are given a robe to change into, and can keep your undergarments on. You cover your hands and feet with special protective socks and gloves. Once standing in the machine, the door closes and you are raised so that your head and neck are out of the cryosauna. The sauna is cooled with liquid nitrogen vapors and the treatment lasts only 3 minutes! With traditional icing protocols, let’s say for a knee injury, an ice pack would be applied for 10-15 min with a break in between multiple applications. Just one cryotherapy session can rapidly increase the speed at which the inflammation decreases, alleviating pain quickly. 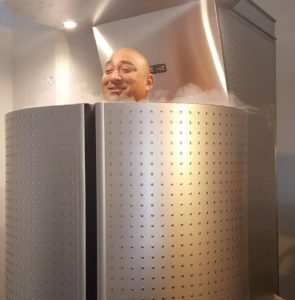 “Research shows that cryotherapy can provide relief from conditions such as low back pain, osteoarthritis, rheumatoid arthritis, autoimmune diseases, and fibromyalgia”, says Gupta. There is evidence to support that cryotherapy can also speed up weight loss. The theory is that your body goes into survival mode when exposed to the brutal cold; this boosts your metabolic rate and burns about 500-600 calories in the process. When you can prevent delayed onset muscle soreness, and quickly alleviate other aches and pains, you can train harder and more often with less downtime. Professional athletes have been using cryotherapy to get back in the game quicker after injury. Now that cryotherapy is more accessible to the general public, it can be used to aid in recovery from strenuous workouts, long distance running, overuse syndromes, prolonged postures, and even a day of golfing. Researchers found that ratings of muscle pain and tiredness were reduced after just the first whole body cryotherapy session. “I feel rejuvenated when I start my day in the cryosauna” says Gupta. There is evidence that cooling the body can help athletes play with a greater level of intensity. Repeated cryostimulation improves position sense and simple reaction time. 20 sessions of whole body cryotherapy may efficiently enhance neuromuscular performance with an ability to sustain the effects for at least three days. “Each session lasts only 3 min, thus it’s easy to incorporate the therapy into a hectic schedule”, says Gupta. Collagen is a protein that gives the skin its strength and structure. Collagen production declines with age, and is reduced by exposure to ultraviolet light and other environmental factors. Cryofacials stimulate collagen production, providing an effective anti-aging strategy. Facials take 6-8 min and the benefits include tighter pores, reduced sagging, and firmer skin. The best part according to Gupta, “the facials are non-invasive compared to other treatment options that are available”. YES! Whole body cryotherapy was originally developed in Japan in 1978 for the treatment of rheumatoid arthritis, and the benefits have been studied and refined in Europe since that time. Problems have only arisen if a client steps into the machine with wet clothing, especially wet socks, as water will freeze immediately at these temperatures. Towards the end of the session, you may get a ‘pins and needles’ sensation, which disappears immediately after the treatment. The following conditions are contraindications to whole body cryotherapy: Pregnancy, severe Hypertension (BP> 160/100), acute or recent myocardial infarction, unstable angina pectoris, arrhythmia, symptomatic cardiovascular disease, cardiac pacemaker, peripheral arterial occlusive disease and severe anemia. Always consult with a healthcare practitioner if you are unsure. ← What Is your Shoe-dule?